Vegetation is one of the most important landscape components whose evolution is primarily controlled by climatic change. In the early Cenozoic, Eurasia was dominated by thermophilic forest vegetation, which exhibited weak latitudinal differentiation. The northern forests were of transitional type between the subtropical and mild temperate and were distinguished by the presence of deciduous species. Throughout the Paleocene and Eocene subtropical and tropical tree species, such as Nipa and Sabal palms and representatives of Myrtaceae and Lauraceae families, were found in abundance in the central and south-western regions of the East European plain (Figure 2.9). In the south-eastern regions, vegetation was quasi-tropical, although it included plants indicative of aridity, such as species of the Myrtaceae family and sclerophyllous oaks. In Western Siberia, forests were dominated by tropical and subtropical taxa (Engelhardtia and palms) typical of hot and humid climates. Similar vegetation (palms, species of Myrtaceae and Santalaceae families) was widespread on the plains of Kazakhstan and Central Asia, while the arid zone located further south became smaller. In north-eastern Asia, the Eocene optimum was marked by the development of the most thermophilic floras of the whole Cenozoic. However, the vegetation was different from that of the vast quasi-tropical zone. Prevailing were polydominant broad-leaved forests of Castanea, Juglans, and Carya with Engelhardtia, Nyssa, Liquidambar, and species of Myrtaceae family. It is possible that during the Eocene climatic optimum the vast forest zone was differentiated, with a subzone of subtropical or even mild temperate forests existing in higher latitudes. The second half of the Eocene and the early Oligocene were marked by a sharp decrease in temperature. The Helinden flora was replaced by the Poltava flora in lower latitudes while the Greenland flora was replaced by the Turgai flora in higher latitudes (Krishtofovich, 1941). These changes varied regionally. They were less pronounced in the south-west of the East European plain, probably due to the influence of the Tethys, and forests preserved their subtropical character although their composition became poorer. More pronounced changes were recorded in Western Siberia. Towards the end of the Eocene, the subtropical tree species were replaced by the mesic small-leaved trees such as Betula and Alnus. Distinct changes occurred in Kazakhstan and Central Asia. In the forest zone, Quercus and Laurus forests became dominant. More arid environments developed southwards in Uzbekistan and Turkmenistan, where shrubs became widespread together with Laurus and Rhus. In north-eastern Asia, deciduous forests, including species adapted to a severe climate such as dwarf birch and Alnaster, became widespread. In the Oligocene, climatic cooling occurred across Eurasia. In the south-west of the East European plain, climatic change in the early Oligocene was less pronounced, probably due to the marine transgression. Pine and broad-leaved forests developed. The latter included evergreen species, although their participation diminished towards the end of the interval. In the central East European plain, forests were mainly composed of species typical of the mild temperate zone, such as Carpinus, Betula, Ulmus, and Alnus, with the participation of evergreen species of the Turgai flora. In Western Siberia, evergreens disappeared and mesic deciduous forests with the participation of conifers became dominant in the early Oligocene. The Turgai flora fully developed in the late Oligocene on the vast lacustrine plains. In north-eastern Asia, the Turgai vegetation was represented by mixed Pinus and Betula forests and, to a lesser extent, by mixed forests with Pinus, Conium maculatum, Sequoia, and Fagus. Here and in central Sakha-Yakutia, the cold-tolerant species became important at the end of the Oligocene and dwarf birch and Alnaster became widespread in the mixed Pinus-Betula forests. In the Neogene, the vegetation pattern changed considerably. At the beginning of the Miocene, climatic cooling continued. The south-west of the East European plain was dominated by forests similar to those now existing in the Northern Mediterranean. The participation of subtropical species increased later in the Miocene, about 21-20 Ma BP (during the first Miocene climatic optimum), and then again about 11.3-10.3 Ma BP (during the second Miocene optimum). 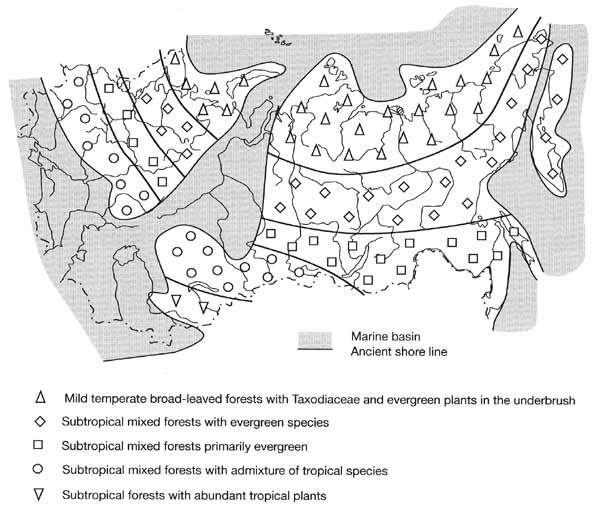 The latter was marked by the development of subtropical forests with the participation of tropical species. Notable changes occurred north of the Black Sea in the middle Sarmatian (10.3-9.0 Ma BP). Increasing aridity resulted in the development of grass communities of a steppe type and the development of a new biome, steppes, between 6.0 and 5.5 Ma BP. This interval coincided with the Messinian crisis. In Western Siberia, the first Miocene optimum (20-18 Ma BP) was more pronounced than the second optimum. Higher temperatures favoured the development of mixed broad-leaved coniferous forests on the lacustrine plains. The middle Miocene cooling resulted in the expansion of small-leaved tree species, in particular Alnus, and the Turgai flora lost its distinct character. Aridity began developing at the beginning of the late Miocene and reached its maximum during Pavlodar time, which correlates with the Messinian crisis. 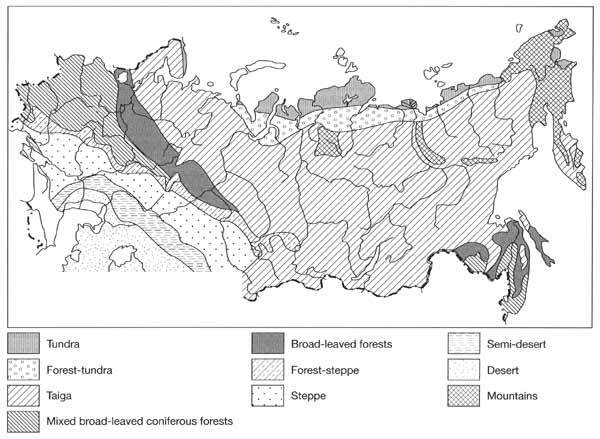 Dry steppes with Artemisia and Chenopodiaceae and semi-deserts developed in the south of the West Siberian plain, where forest survived only in riparian locations. The process of aridization was more conspicuous in Kazakhstan and Central Asia throughout the Miocene. First, stable grass communities with representatives of Compositae and Polygonaceae families, Artemisia and halophytes developed as early as the Burdigalian (middle of the early Miocene). By the late Miocene, the steppe zone had extended from the river Irtysh to Lake Balkhash. Pine and birch forests with an admixture of conifers, Fagus, Tilia, Ilex, and Ulmus dominated north-eastern Asia and central Sakha-Yakutia in the early Miocene. Later, during the colder phases of the middle Miocene, they were replaced by mixed forests dominated by conifers. The Miocene marked the beginning of the development of the structural framework of modern landscapes, although considerable restructuring occurred in the Pliocene, fn the early Pliocene, climatic warming, and consequently, changes in vegetation occurred between 5.0 and 4.2-4.0 Ma BP. The 4.2-4.0 Ma BP interval represents the Pliocene thermal optimum. In the southwest of the East European plain, forest-steppes typical of the end of the Miocene were replaced by the broad-leaved forests of the mild temperate zone. During the Pliocene optimum, subtropical species became widespread in these forests while herb and grass communities were dominated by meadow and bog species. European plain and southern Western Siberia featured dry steppes with some tundra elements, with aridity increasing eastwards. Throughout the Eopleistocene stage (1.6-0.7 Ma BP) of the Quaternary, climatic fluctuations occurred against the background of general climatic cooling and aridization. Best researched are climatic fluctuations on the East European plain, where a number of warm climatic phases occurred. In the south, climates were close to subtropical and forest communities dominated. In the central part, mixed broad-leaved coniferous forests with some subtropical taxa developed. During the colder phases, cold steppe landscapes, precursors to later periglacial steppes, developed and open woodlands containing coniferous, and rarely, broad-leaved trees occurred locally (Grichuk, 1989). Tundra, forest-tundra and periglacial steppes existed in Western Siberia, the Lena basin and the north-east of Eurasia (Velichko, 1998). In Central Asia, sedimentary sequences in forelands and intermontane basins have revealed alternating drier (recorded in loess horizons) and wetter (recorded in fossil red and red-brown soils) stages. The frequency and range of climatic fluctuations increased in the Pleistocene. During cold stages, zonal differences diminished and the hyperzonal structure of landscapes developed (Velichko, 1989). Climates of the interglacial stages of the lower Pleistocene were similar to those of the Eopleistocene, as indicated by subtropical fossil soils in the south of the East European plain (Morozova, 1981) and the presence of the American and East Asian tree species in pollen spectra. Typical steppe vegetation has been reconstructed in the south-east of the plain while the rest belonged to the forest zone. Mixed broad-leaved coniferous forests with Fagus, Juglans, Pterocarya, and Tsuga developed south of 57-58°N, while in the north birch and birch-pine forests with a few broad-leaved species dominated (Grichuk, 1989). During the last interglacial of the lower Pleistocene, which followed the maximum Don glaciation, the zonal pattern on the East European plain was similar to that of the previous warm stages although some changes occurred in the forest zone. The proportion of broad-leaved species, such as Fagus and Zelcova, indicative of mild environments, was reduced and the area occupied by mixed broad-leaved coniferous forests decreased. In the north of the plain, coniferous forests with some broad-leaved species retreated to 57-59°N and further north typical boreal formations of Betula and Betula-Pinus forests became widespread. Similar vegetation existed in Siberia. In the southern Far East, forests developed throughout the early Pleistocene, although their composition changed. At the beginning of the interval deciduous species dominated while at the end of the interval forests were composed of dark coniferous species. The interglacials (Likhvin in the East European plain and Tobolsk in Siberia), which occurred at the beginning of the middle Pleistocene, are relatively well studied. The structure of vegetation was similar to that of the previous interglacial of the lower Pleistocene. 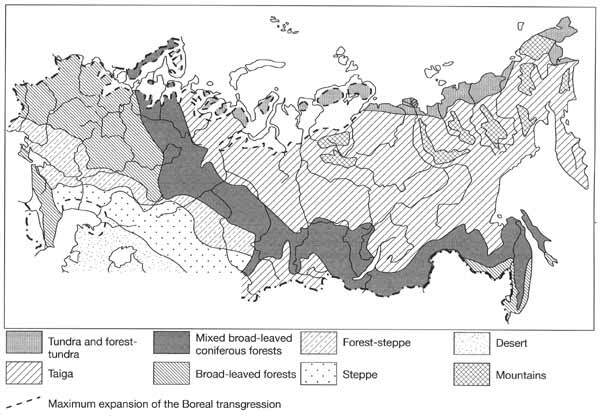 Outside the limited steppe zone, vast areas reaching to the northern coast were occupied by forests subdivided into three latitudinal belts: the mixed broad-leaved coniferous belt; coniferous forests with the participation of broad-leaved species; and Picea-Betula forests (Grichuk, 1989). In the mixed broad-leaved coniferous forest belt, which was most extensive, flora included such species as Fagus, Castanea, Juglans, Pterocarya, and Zelcova. Many representatives of this flora have survived until the present, in contrast to the species which dominated the earlier floras. The fossil soils dated to this period reveal signs of prairie only (as opposed to subtropical) soil formation even in the south of the East European plain (Morozova, 1981). In Western Siberia during the interglacial optimum, the middle taiga occurred in the northern regions, reaching to the Arctic coast; the southern taiga developed in the central part; and forest-steppe and steppe occurred south of approximately 56°N. In Eastern Siberia, the earlier warm phases of the middle Pleistocene featured forest-tundra communities such as Larix and Betula open woodlands and shrub tundra. Generally, analysis of vegetation reveals the evolution of a more severe climate in the middle Pleistocene. The best studied are the environments of the late Pleistocene (Grichuk, 1984). The zonal pattern reconstructed for the interglacial (Mikulino in the East European stratigraphic schemes and Kazantsevo in the Siberian one), which marked the beginning of the interval, was very different from the modern one (Figure 2.10). On the East European plain, steppes occupied a larger area in comparison with the previous interglacials and reached as far north as the middle courses of the Volga, Don, and Dnieper, although small woodlands occurred locally as indicated by the presence of forest soils amongst prevailing chernozems. Most of the plain was covered by forests composed of Carpinus, Quercus, and Tilia with the participation of Betula and conifers. Forests extended to 60°N in the west and 56-57° in the east. Vegetation communities, typical of Western Europe at present, were widespread and brown forest soils dominated the region. North of 60°, coniferous forests developed with the participation of broad-leaved species, and a narrow coastal strip was dominated by coniferous and open Betula woodlands (Gerasimov and Velichko, 1982). In the south of the West Siberian plain, forest-steppes developed while the herb-grass and grass steppes have been reconstructed for southern Kazakhstan and Central Asia. The boundary between steppes and deserts was located in the region of modern deserts. Further east, in southern Central Siberia (the Minusinsk depression), in the Transbaikalian region and locally along the Amur, isolated patches of steppe vegetation occurred. The southern taiga occupied the central regions of Western Siberia and the northern taiga developed northwards, reaching the Arctic coast. Pinus and Larix forests were widespread in the mountains of Eastern Siberia as they are today. In central Sakha-Yakutia, forests with Pinus sibirica developed, indicating that the climate then was milder than now. Similarly, Larix and Betula forests of the northern taiga type reveal that the coastal lowlands of north-eastern Asia, including the lower Kolyma region, also experienced a milder climate. In the southern Far East, the interglacial optimum was marked by a notable rise of the ocean level (by 8-10 m) and the development of broad-leaved forests of the Manchurian type. The paleobotanic evidence obtained from the sediments postdating the optimum reveals that severe climatic conditions developed on the East European plain. There is a considerable decrease in the proportion of tree pollen and only the proportion of Betula pollen increases. It is likely that Betula forests became widespread, although the share of dwarf birch pollen, typical of the forest-tundra and northern taiga, is large. The accumulation of loess also testifies to the colder climate and sparse vegetation. Forests were replaced by open landscapes. This tendency is clearly traced throughout the short warmer interval (the Krutitsa interstadial correlated to the Brarup). The chernozem-like fossil soils, dated to this interval, are found in many localities where broad-leaved forests and brown forest soils have been described in the Mikulino horizons (Morozova, 1981). Further decline of forests and the development of open landscapes marked the subsequent cooling dated to 70-50 Ka BP (the early Valday). It was followed by a warmer interval (the optimum of which occurred between 35-32 Ka BP and 25-23 Ka BP) when the taiga forests were widespread in the central East European plain and the forest-tundra and tundra developed in the north. In Western Siberia, the post-Kazantsevo (early Zyryanka) cold stage, which is correlated with the early Valday of Eastern Europe, apparently resulted in the degradation of the dark coniferous forests and the replacement of the southern herb and grass steppes by the periglacial cold steppes. However, during the subsequent warming, both climate and vegetation were similar to those of today. This warm interval (with the optimum at 30-22 Ka BP) is often considered as an interglacial (Arkhipov et al, 1993). In the East European plain and Siberia, the middle Valday and middle Zyryanka warming was followed by the coldest stage of the whole Pleistocene known as the late Valday or late Zyryanka (Sartan) glaciation. As in previous glacial ages, a hyperzonal structure of landscapes developed with a dominance of open landscapes (tundra, periglacial steppe, dry steppe, semi-deserts, and deserts) and a diminished forest zone. Mixed and broad-leaved forests survived locally in refugia and probably in the southernmost regions of the Far East, where their boundary shifted southwards by about 10 degrees latitude. During the transition to the Holocene, warmer periods (Boiling and Allerod) alternated with the cooler (Oldest Dryas, Older Dryas, and Younger Dryas) stages every few thousands of years. These fluctuations were similar to those of the Holocene, although the latter proceeded at a higher thermal level and showed a smaller range and longer period. Recent investigations have shown that the taiga-tundra ecotone was dynamic and that the forest and tundra zones underwent a considerable transformation during the interval. Changes in vegetation varied considerably between the western and the eastern regions. The paleobotanic studies carried out in the Pechora and Northern Dvina basins, have shown that tree vegetation developed in the Allerod but periglacial landscapes were restored shortly in the Younger Dryas. During the Preboreal, Pinus and Betula forests developed in the areas now occupied by taiga, although towards the end of the Preboreal tundra elements became prevalent again. The environment changed considerably during the Boreal optimum. Forests advanced at least 100-200 km north of their present limit. The dark coniferous forests developed up to 64°N and the northern taiga with Betula occurred further north (Khotinsky, 1984). However, at the end of the Boreal optimum, climatic cooling resulted in the replacement of forests by tundra. During the Atlantic, forests with Larix and Pinus sibirica advanced northwards and the late Atlantic interval (6-5.5 Ka BP) is known as the main climatic optimum of the Holocene (Figure 2.11). During the optimum, southern taiga with the participation of Quercus, Ulmus, Acer, and Corylus avellana developed about 200 km north of its modern limit in the place of the middle taiga. The middle taiga subzone moved 450-500 km north, and northern taiga forest developed along the Barents coast. Since the first half of the Subboreal, progressive cooling occurred and zonal boundaries shifted by 100-300 km southwards. After a short warming in the second half of the Subboreal, when forest species were widespread, the tundra zone gradually expanded to its modern size. Similar sequences of climatic fluctuations have been reconstructed for Western Siberia and the Far East. In Siberia, the climatic optimum also occurred at the end of the Atlantic (6-5.5 Ka BP). Broad-leaved trees (Ulmus, Tilia, and Quercus) advanced up to 60°N along the Ob valley and forests composed of Alnus and Betula spread into the tundra zone. On the Taymyr peninsula, the climate in the late glacial (11-10.3 Ka BP) was more severe than at present and tundra existed in place of the modern open Larix woodlands. However, during the Preboreal, the position of forest-tundra approximately corresponded to the modern one. Later, during the Boreal optimum, the forest-tundra with Picea and Betula advanced northwards, into the regions of the modern arctic tundra. Larix wood found in the modern tundra zone and dated to about 5.5-5.7 Ka BP indicates that the Atlantic optimum was marked by the further decline of tundra vegetation. During the Subboreal cooling, tundra expanded southwards. Further eastwards in the Yana basin, shifts in the vegetation zones were less well expressed. The analysis of vegetation zone dynamics in various regions has shown, therefore, that in the west a shift in zonal boundaries was stronger than in the east. This can be attributed to the eastward decrease in intensity of the westerlies. In the Far East, the middle Holocene interval, considered as the climatic optimum (7.5-4.9 Ka BP), was marked by the wide development of polydominant broad-leaved forests with a number of thermophilic species.